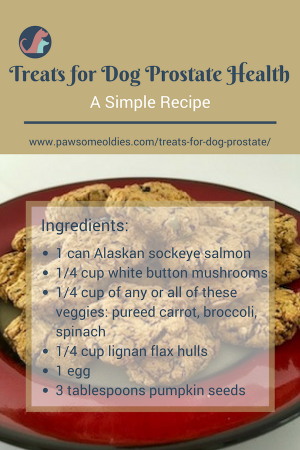 In this post, you will find a recipe that makes treats for dog prostate health. The ingredients used in these treats are healthy for all dogs, and in particular, they support prostate health in dogs. Older male dog who are not neutered (intact), are prone to the development of prostate problems, such as prostate enlargement and prostate inflammation. These problems may be caused by bacterial infections. Fortunately for old male dogs, there are herbs and foods that can help promote and support prostate health. 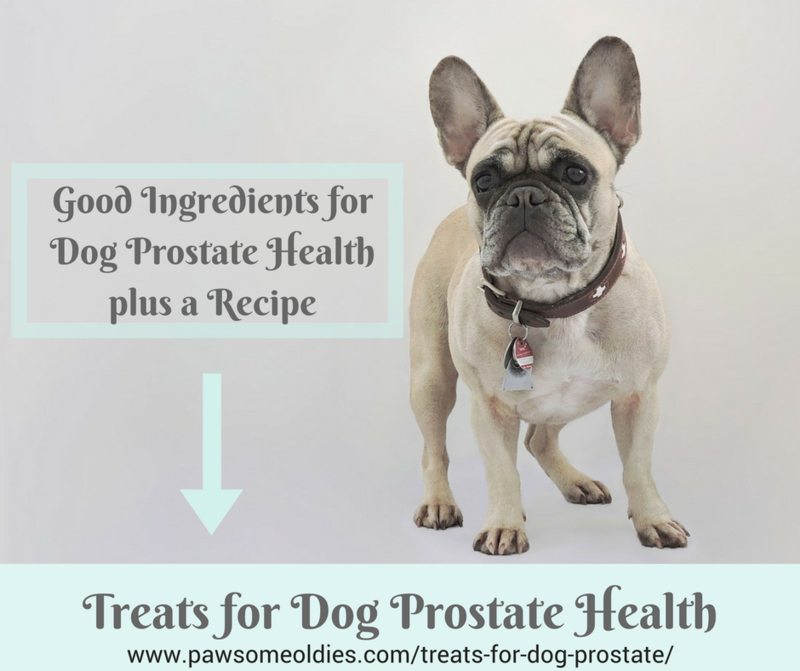 This post focuses on some food items that can be used to make yummy treats for dog prostate health. Actually, quite a few food items are excellent choices for dog treats that support prostate health, and that’s good news for Fido! These are the shells of flaxseeds without any seed materials or oil. The hulls are rich in lignans (phytochemical compounds), which are powerful free radical scavengers and are therefore strong antioxidants that help boost the immune system. In addition, flax hulls are rich in Omega-3 fatty acids, another powerful antioxidant. Omega-3 FAs are anti-inflammatory as well. So if a dog has prostate inflammation, flax hulls can help reduce the inflammation. More importantly, flax hull lignans have been found to be anti-tumorous. According to a study cited by the American Cancer Society, flax hull lignans helped slow down the growth rate of cancer cells in men suffering from prostate cancer. Fatty fish such as salmon is rich in Omega-3 fatty acids, which, as mentioned before, have powerful anti-inflammatory properties. Research has found that Omega-3 FAs can inhibit tumor growth, therefore helps prevent prostate cancer (and other types of cancer for that matter). Vegetables that are rich in beta-carotene, lutein, and vitamin C are recommended as beneficial foods for prostate health, as they are antioxidant-rich and can reduce inflammation. Some such veggies that are good for dogs include broccoli, carrots, spinach, and red bell peppers. Also, white button mushrooms have been found to be able to lower the PSA levels (prostate specific antigen) of people with prostate cancer, meaning mushrooms can reduce prostate enlargement in cancer patients. As mushrooms are good and nutritious for dogs, it doesn’t hurt to add this food item to the dog’s diet! Pumpkin seeds are rich in zinc, which is important for prostate health. They also contain compounds called “phytosterols”, which may have the ability to shrink the prostate. As you can see, if your dog has some form of prostate problem (e.g. enlargement), you can add some of the above food items to his diet, and use some of the items to make healthy dog treats, like the one below. Make 1″ balls and place them on baking sheet. Flatten balls with a fork. Lignan flax hulls are different from flaxseed meal. Be sure to use flax hulls. Since these treats contain fish, they have to be refrigerated. They stay fresh for one week in the fridge.